First of all, we build it your way, serving delicious food fast, customized just the way you want it. Second, every dish is made fresh with only the very best ingredients. We take pride in helping you make healthier choices, so you can enjoy dining with us much more often. Third, we reward you for doing so with our Maverick Rewards program! Last but certainly not least, we give back to the community, taking special care to honor our first responders – including military, police and firefighters. You’ll always find a delicious, healthy meal to satisfy your hunger and your heart at Maverick Grille! Serving lunch and dinner daily at all locations in Southwest Florida, Maverick Grille has something for everyone from rice bowls, gyros, soups and salads to healthy sides and desserts. Everyone needs to eat, and Maverick Grille fills that need by serving delicious, healthy cuisine. 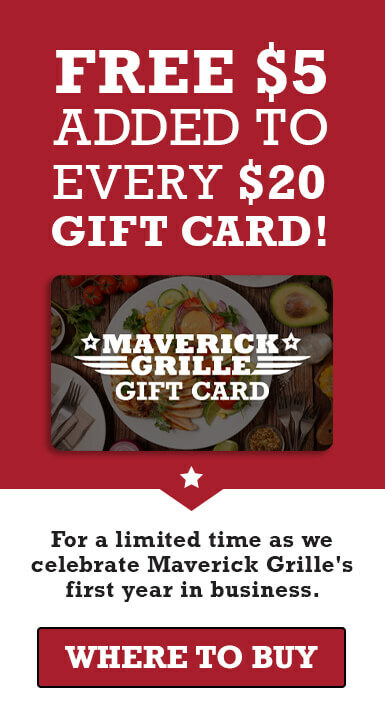 A Maverick Grille gift card is the perfect gift for food lovers in Southwest Florida! We reward those who are loyal to a fault! Join our Loyalty Club to earn points toward special offers and discounts!